Vilno makes interesting points here which I mostly agree with. But obviously i'll focus on our subtle or minor differences! I think it's important to underline that by "privilege" i mean above all the idea of an artificial distinction between individuals. In a sense liberal factionalism was a huge argument about what "artificial" mean. Where I slightly disagree with Vilno is that in my opinion this does not necessarily mean an underdog (though of course it can) - not least because an underdog is a contestable concept . So for example in Ireland was the underdog the Catholic majority with it's history of discrimination against it or the Protestant minority which was seen as threatened by being marginalized ( indeed the independence of most of Ireland in the 1920's saw a huge exodus/ expulsion of Protestants from the new territory). However opposition to any Home rule in Ireland clearly consisted of a belief Irish national claims were inferior to British even against the will of the Irish majority- a “distinction” if you will (of course the Pro Union majority in Ulster added a new set of complications). .
Perhaps the best example of the problems of seeing this in terms of "underdogs" is on economics where liberal ideas of privilege led in opposites direction.. So William Wedgwood Benn (the father of the more famous Benn) was a believer in state planning and intervention on economics and intervention which led him to the leftwing of the post war Labour party-flowing from his opposition to what he saw as artificial distinctions of land inheritance and so forth. in the latter 1920’s His elder brother Sir Ernest Benn also of liberal background own notions of privilege consisted of opposing all the distinctions and coercion of government regulation (at least by the late 1920’s)- he was much more free market than the conservatives! . There is no way they could both have been supporting the underdogs at least domestically since they had essentially opposite policies! Which is not to say there were not particular underdogs they were not supporting- sympathy for the underdog can motivate contradictoy policies in different people. Another way to look at it is the number of politicians who saw themselves as fighting “underdogs” is very low at more or less all times-while plenty of politicians have supported “distinctions” that could be considered artificial from legal immunities to government pensions of one kind or another. Similarly the conservatives could be seen as being the party of patriotism and tradition-but the liberals were not in the main against this either. The key point was that conservative ideology did not have the same depth problems with such “patriotic” policies as tariffs, the Boer War, World War I or the maintenance of thee existing unions than liberal ideology did- on the contrary it’s defence of property and instituions fitted in very well with itAt the same time many liberals saw near monolithic Tory support for a European war as “unpatriotic” –just as Tories sometimes saw Liberal opposition to tariffs as showing a lack of sympathy for the plight of workers in industries such as Textiles. Ultimately this is because divisions over policy in democracies require some degree of difference in values. An individual illustration is Kipling. Kipling had a profound personal sympathy with underdogs as one can tell from his works. Similarly Gladstone was patriotic. However Kipling’s’ underdog sympathies did not make him support Home Rule or a conciliatory line to Germany-because it clashed with his ideology of nation and how to defend it. Similarly Gladstone was patriotic-but his patriotism did not stop him ultimately supporting Home Rule or opposing high defence expenditure-because it clashed with his notion of non distinguishing government and “national equality”. I think to some degree this represents a methodological distinction between Vilno and I. I think I tend to empathise more the power of the ideology of a party to shape it’s agenda, Vilno the power of it’s social base. Though we’d both accept both are very important. I would also tend to take a less profound view of the differences between the two parties on the welfare state in this era-the conservatives very rarely objected in principle and some of the most extensive expansion in government provision in housing and land reform were carried out by the admonition of Lord Salisbury. In my opinion what differences that exited flowed mostly from the differences in taxation- the notion of privilege provided at least a prime facie concept for polices like Death Duties , land tax and so forth to fund in an era where balanced budgets were axiomatic across the political spectrum from Hugh Cecil to Hobson pensions etc could be seen by many liberals as being paid for from the products of privilege- and so a welfare state could be paid for in an acceptable way! This was also more progressive than tariffs as Vilno rightly says- though I would add that land taxes might have been regressive in economic impact (because of increasing the rents off poor tenant famers and lowerng the pay of labourers)-I’m not sure. 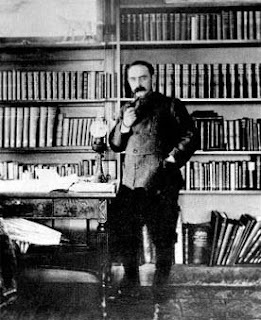 In the light of my frequent mention of him is a picture of Kipling- the first Conservative and Unionist to get a picture in this series. ! Thanks for your response. On the first point, I agree that the female voters added to the register in 1918 probably disproportionately favoured the Tories. However, I would suspect that the _men_ added to the register - being younger and poorer - would have been more likely to support Labour. I agree, though, that - until the implosion of the Liberal party - it would have been difficult for Labour to do well. It was the problems facing the other party of the left that helped Labour in 1918 onwards - not so much the extension of the franchise. In terms of 'privilege' being artificial distinctions between people, then a lot does indeed turn on what 'artificial' means. I think that the Left would argue that much private property was itself artificial. In a sense, that is why the Liberals moved leftward, as more of them thought that private property [particularly inherited property] was an artificial distinction and one the state should ameliorate. Obviously, to some degree the def'n of an "underdog" is subjective but, to my mind, it does tie in with taking a critical approach to 'privilege'. Those who are not privileged are the underdog and so a party opposed to privilege would be predisposed to side with them. I don't think the Conservatives would have concieved of themselves the same way. In so far as they thought about ideology it was about maintainence of the established church and of the union. That is different from the positive conception of the state (of left-liberals) who would have seen it as a tool to challenge privilege rather than an instrument to maintain the status quo. Vilno on your first para i think we basicaly agree.! on the second two I don't think we really disagree-and I better make sure I keep to Grachi's wish to keep the blog apolitical! My piont was merely thetwo aren't necessarily the same-and in a sense politics is always a choice between underdogs. I hope to show conservative ideology was a bit more complex and diverse in this period-though that is certainly a decent summary! Thanks for your comment. I think that, in terms of analysis, we tend to agree on a lot of points. The one (semantic?) difference is that I see challenging privilege and standing up for the underdog as linked. The opposite view is not so much standing up for a different set of underdogs as for defending the status quo and/or for making the case that the 'privilege' that keeps the 'underdogs' down is not really privilege. As you say i think we largely agree here. My piont is that "priviledge" as I'm defining it -doens't necessarily have to be on behalf of overdogs rather than underdogs,the priviledging of unskilled working class english workers over skilled immigrants, welfare benefits for the very poorest etc can all be seen (and were) as forms of "priviledge"